Who would have known back in September of 2015 that I would become a published author in June of 2016? I had always told myself, and others, that I couldn’t write. My inner critic consistently supported the belief that writing was hard and that what I had to share didn’t really matter. Why would I undertake a task that was difficult for me and couldn’t possibly make a difference in the world? That belief system “bs” amazingly cracked ever so gently as I was gifted an opportunity to attend Christine Kloser’s Transformational Authors Breakthrough (TAB) conference in September, 2015. The Universe seemed to be clearing the way – I was astonished that my calendar was clear on those days. So, I registered for TAB with the intention of hanging out in the background with no responsibilities or expectations. However, I was literally consumed by awareness that my soul was putting out an intense call that I could not ignore, that it was time to put my story in writing and I was the one to do it – no matter what! The old “bs” was fighting for its life. “Oh, no, not in writing! That’s too challenging. It’s overwhelming! Where can I possibly find the time, resources, etc?” On the final day of the conference, after a sleepless night of seeking Guidance and clarity, I made the commitment to ME (My Essence). I said “YES, I am going to do this”, and I turned in my application to participate in the Fifth Wave of Christine’s MasterHeart Program. A deep sense of calm enveloped me as soon as I signed the application. I knew I had to face some of my fears, yet there was a profound sense of assurance that I was being supported and that everything I needed was being provided. My job was: (1) to hold firm to my commitment, (2) to trust in positive outcomes, and (3) to allow the “how” to show up differently than I think. After returning home, these three tenets became my beacon and it’s a good thing. I began writing about my experiences and challenges of growing up in Hope, Arkansas. 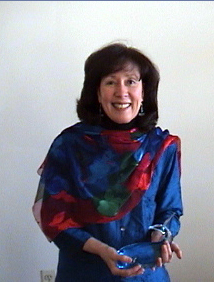 I had titled my chapter, “Hope: Good Medicine”, and it was almost finished when I had a coaching call with Christine. I was being guided by an Inner Source to change the focus of my writing to an unbelievable experience I had in the Great Pyramid in Egypt. It was decision time. I would have to begin a new chapter if I wrote about Egypt and the submission deadline was near. In the coaching session with Christine, it became clear that I had a whole lot more energy around my experience in Egypt. 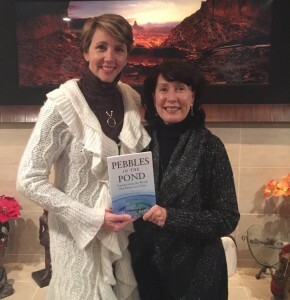 Today, June 21, 2016, “Pebbles in the Pond, Wave Five”, is being launched and I am filled with such gratitude and excitement! My chapter is titled, “Encountering the Mystery”. I hope you read the messages that came through in the Queen’s Chamber in the Cheops Pyramid in Egypt. They are important for these times in our world. 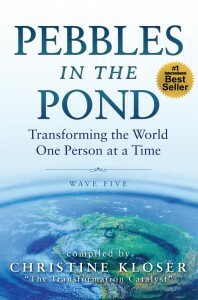 You can access a copy at www.PebblesBook.com. Last night I was reflecting on my experience of becoming a published author. I looked back to notes in my journal on September 22, 2015, the night I wrestled with the decision to apply for the MasterHeart program. I found a statement that almost jumped off the page. It said, “The deeper the commitment, the easier the needs are met.” That sentence has shown up as truth for me. It has been an honor to work on this book alongside other transformational authors. The whole process of being part of a cohort has been life changing. We are a diverse group of messengers with unique stories, yet our messages have a common thread of inspiration, hope, healing, transformation, and new possibilities. I’m working on my own book now with a goal to have it published in early 2017. I have come to realize that I do have something important to share and that writing my story is healing – for me! If someone else gains hope, courage, insight, or inspiration from reading about my experience, that’s a bonus.